US SPACE agency NASA has been forced from its usually tight-lipped stance on alien visitations after video allegedly showing several UFOs passing a window behind an astronaut on the International Space Station (ISS) emerged. 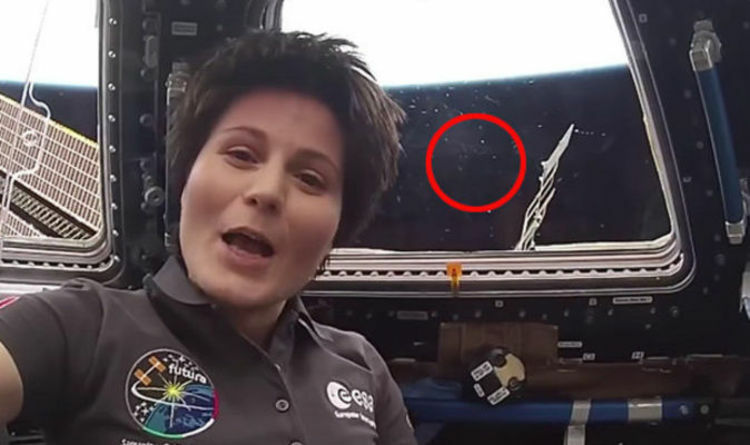 UFO hunters claimed the footage caught by cameras on board the ISS and released online by NASA was conclusive proof aliens exits.The video, uploaded to several UFO websites, shows Samantha Cristoforetti, an Italian European Space Agency astronaut, demonstrating how to operate window shutters at the ISS.But as she talks to the camera, several white objects appear to come shooting into view.Tyler Glockner posted the footage, uploaded on March 18, 2017, to his UFO sightings YouTube channel Secure Team.He described one of the unknown objects seen hurtling past the ISS as a “smoking gun UFO”.Secureteam10 describes itself as an “underground” research team that exposes the truth about extraterrestrial and UFO coverups.It has been criticised by debunkers for knowing misrepresenting anomalies in videos, something it denies. The UFOs (circled) which passed during the NASA ISS video. It is the latest in a string of claims by alien chasers that UFOs have been caught in the background of the ISS livestream cameras, but there is a major cover-up by NASA underway, with it often cutting off the cameras once one come into view.NASA, which says it has found no evidence yet of alien life during any of its missions, usually does not respond to such claims. This is possibly because so many are made.But, following the latest claims, the agency issued a statement.It said: “No unidentified objects in the popular sense have been seen from the International Space Station.”Reflections from station windows, the spacecraft structure itself or lights from Earth commonly appear as artifacts in photos and videos from the orbiting laboratory.”Last year veteran American astronaut Tom Jones also dispelled the myth. There were claims last year that an astronaut tried to block out a passing UFO with his hand. He said: “Astronauts have not seen any evidence of alien life. “Reports of unidentified flying objects in images returned from the shuttle or [space] station have turned out to be ice crystals, drifting orbital debris, lightning flashes, or meteors streaking through the dark atmosphere below. Conspiracy theorists like Scott C Waring, who runs website ufosightingsdaily.com, claim that NASA and Mr Jones are just part of the “cover-up” and he dismisses their explanations, convinced that every bright light or blurred object seen on camera in the distance from the ISS is an alien space craft. But, Scott Brando, who forenisically examines alleged UFO pictures and videos, before releasing debunking articles on his website ufoofinterest.org is more level headed. He told Express.co.uk that the UFOs caught on camera were either lens reflections or ice particles. In the case of the latest footage, he said they were ice particles. He tweeted: “According to SecureTeam10 this object is a #UFO outside #ISS window.